Most of my life I have been fascinated with artists and creatives and I’ve always dreamed about being a part of their magical world. I know that’s why I originally got into the business of fashion and now through this website I am able to showcase some of the interesting and unique artists I have found along my path. 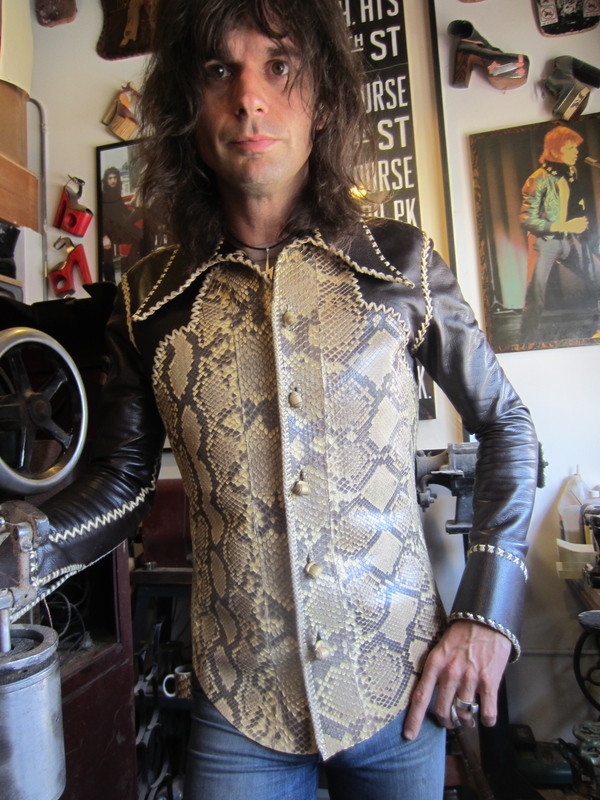 Chris Francis of Lovecraft Leather is one of those magical people that I have been lucky enough to encounter. We met in Laurel Canyon a few years ago at my friend Emily Factor’s house the same night I met the ladies of Heyoka Leather. Chris was with his glamorous and beautiful lady, Vanessa Gonzalez (who was a contestant in Bravo’s Launch My Line), and they were both decked out in the sickest leather duds and platform shoes I had ever seen. 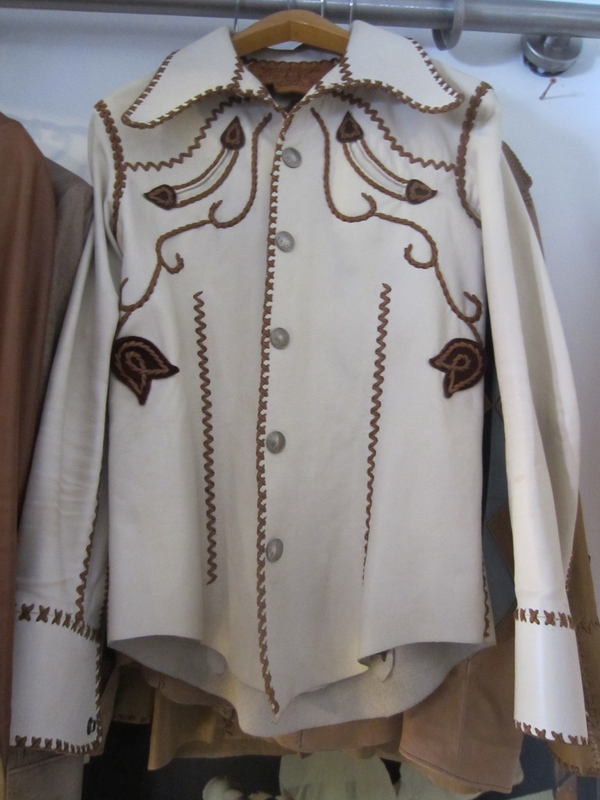 When Chris told me that he had made everything they were wearing, I was fascinated. It took a little bit of time before I was able to get a closer look into his studio, but it was well worth the wait. 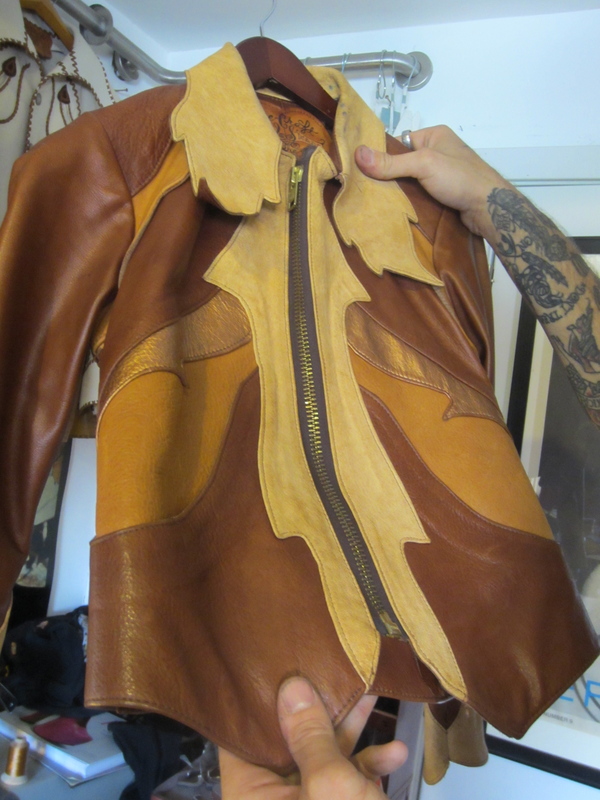 Chris is a self taught artisan and first started 4 years ago by creating leather jackets on a picnic table in the Silverlake dog park after his arrival in Los Angeles. He started by studying books from FIDM and bought a $40 sewing machine from Target to experiment with. 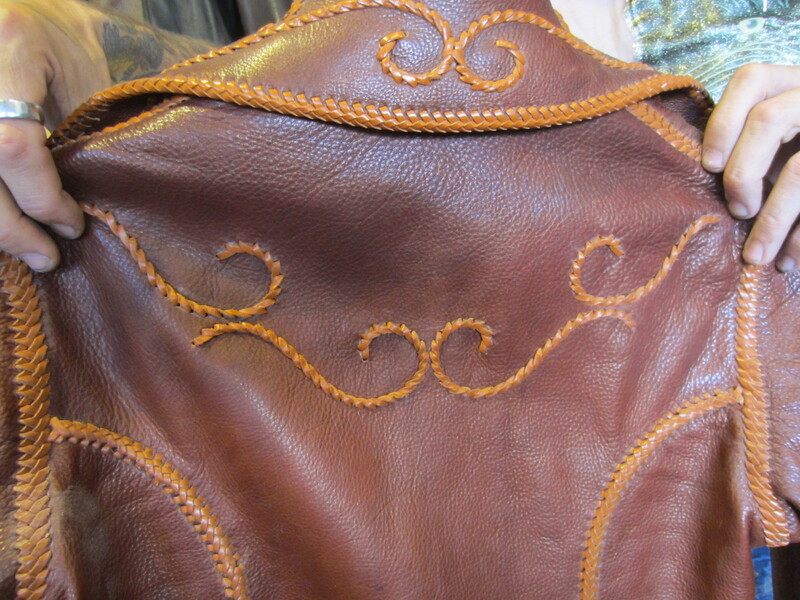 To his surprise, his very first jacket ended up on stage that year for the Journey world tour and he officially started creating his fantastic leather creations for musicians from that point on. Chris is completely inspired by music and his creations have since ended up on the likes of Lita Ford and Mitch Perry to name a few. 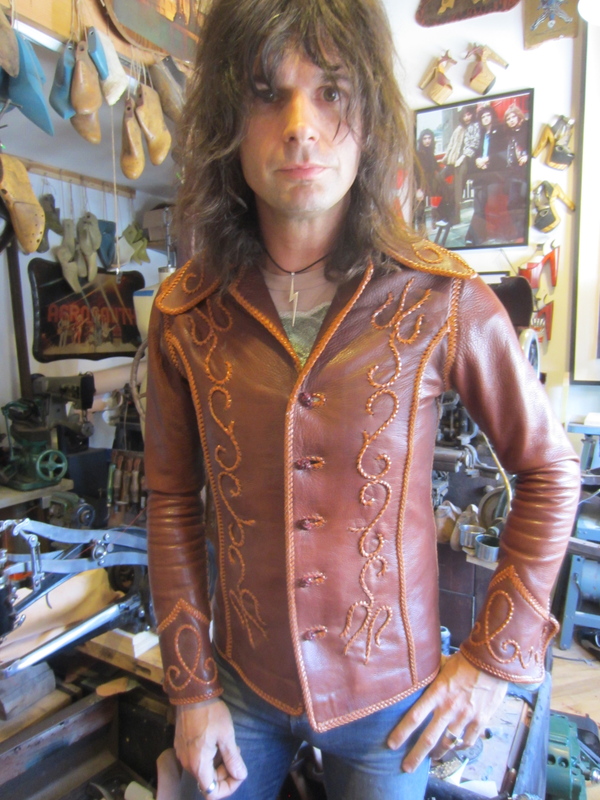 His leather apparel is a rock n roll fantasy and takes inspiration from the 1970′s and 80′s channeling the musicians that have inspired him along the way. 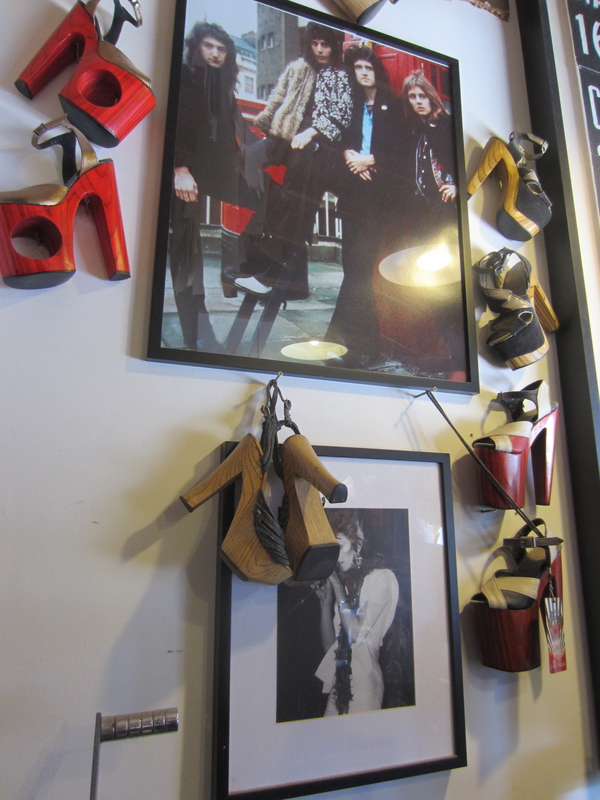 His studio displays his passion with vintage rock posters and decor hanging in every open space. Everything Chris makes is with his hands and all are custom made to measure. He is very inspired by vintage clothing and textiles and his mission is to “create a world that speaks to him and put art into the world rather than just products.” Mass production is his nemesis; Chris wants his world to be small and underground and he has gotten all of his clients by word of mouth rather than traditional marketing and sales tactics. This man has serious passion for what he does and he stays in his shop for hours each day barely coming up for air. Not because he is trying to make a dollar, but because he loves creating his magic. Chris modeling one of his first creations. 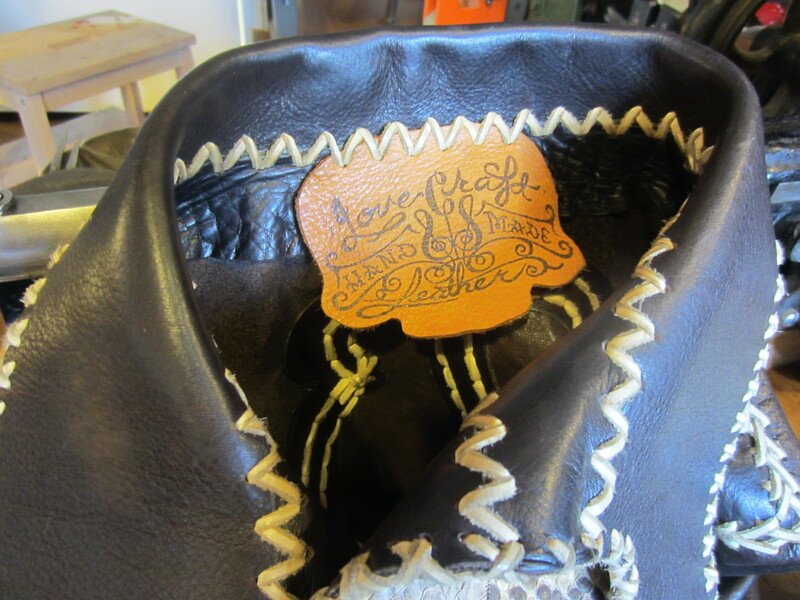 His leather apparel was a start for his launch into creating hand made shoes which is something that he had dreamed about since childhood. 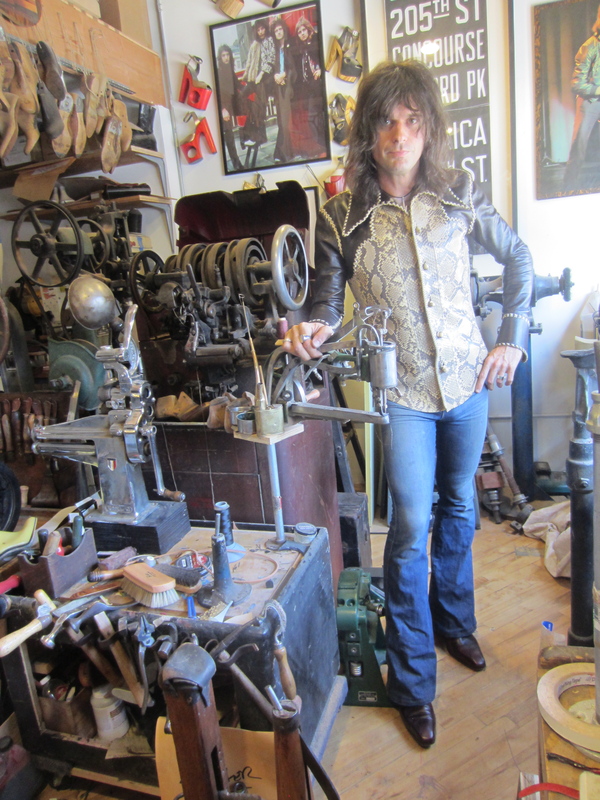 Just as he did with his first jacket, Chris tackled this dream on his own and is a self-taught cobbler. 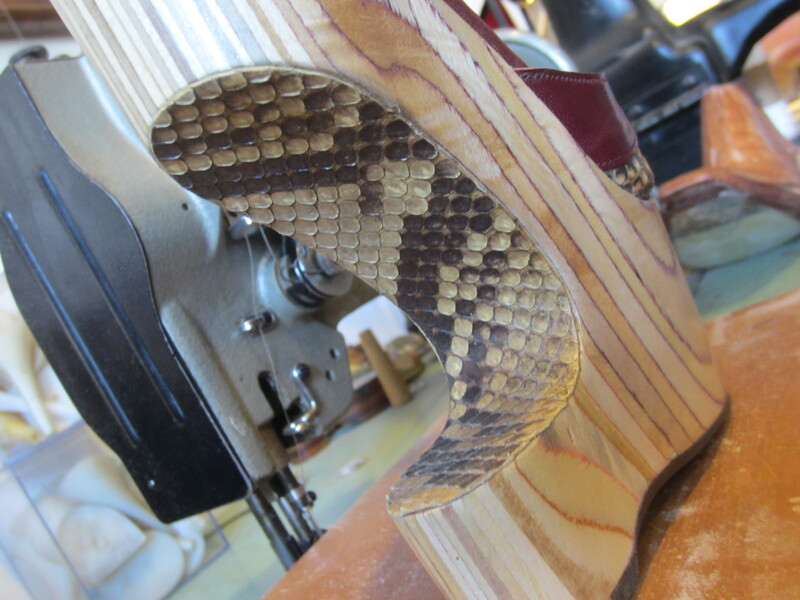 I’m completely fascinated by the fact that someone can actually teach themselves how to make shoes, but with Chris he makes it all seem very easy. 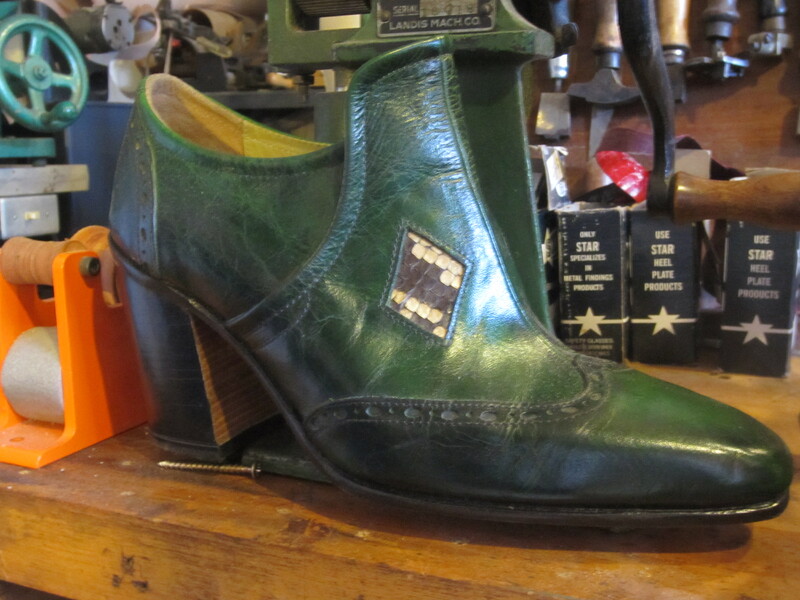 During our interview, I was educated by Chris on his biggest inspiration, Salvadore Ferragamo, and the fact that he was also a self taught cobbler. 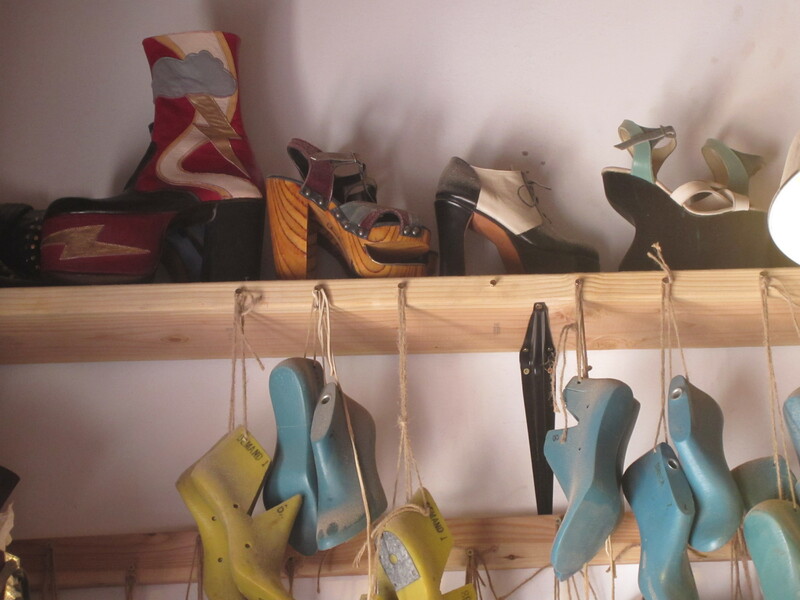 Ferragamo opened his first boutique in Hollywood and didn’t have any training. 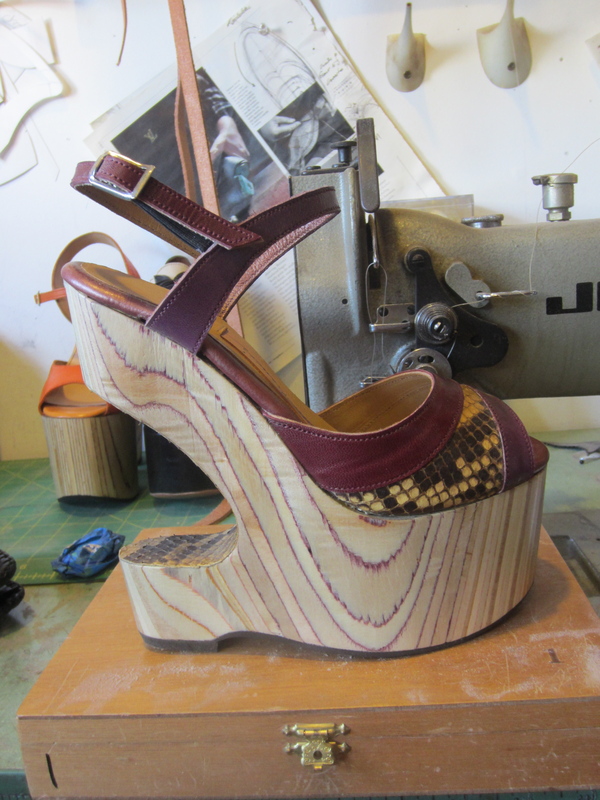 His first creations were made using leather scraps that he found and Chris’s vision for shoes was inspired by this idea. 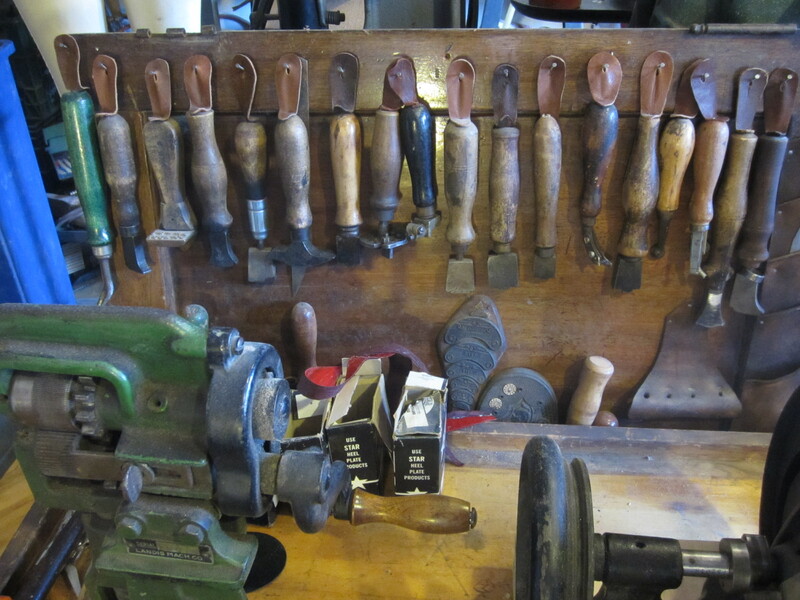 To teach himself, Chris started visiting all of the old school cobblers in town asking if he could intern for them. Most turned him down, so he tried a different approach and instead asked to buy some of their vintage tools. 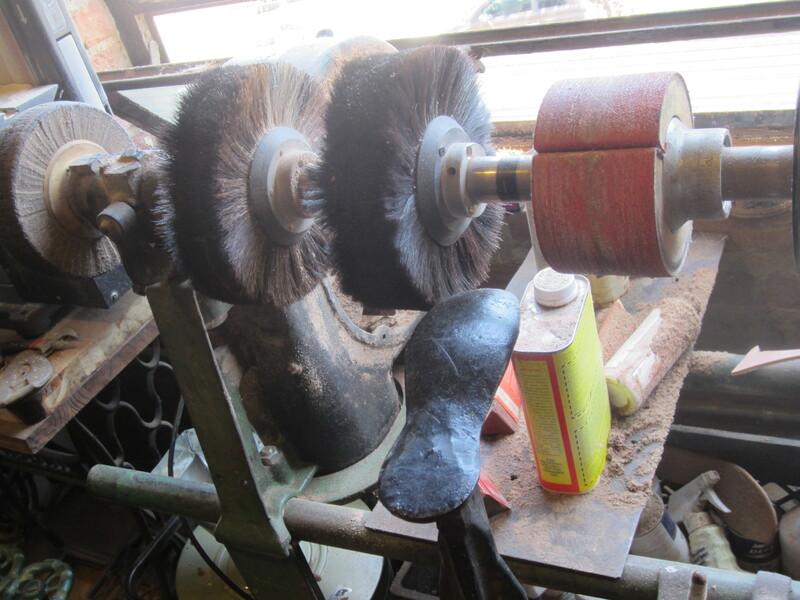 Through the process of inquiring about the tools, each cobbler showed him a new technique and after he acquired a complete set of tools, he also acquired a wealth of knowledge to get started. 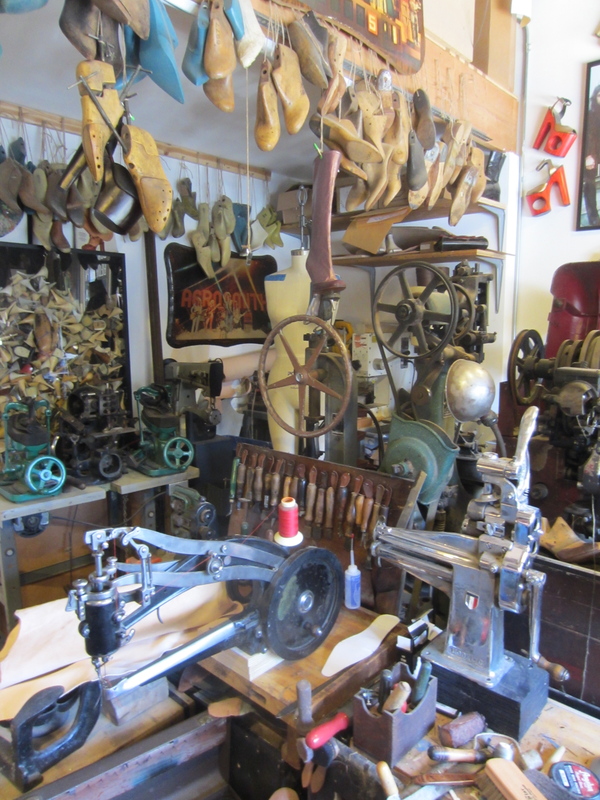 From there he sourced vintage equipment and lasts (shoe molds) and he started to design his own creations all by hand, the old fashioned way. This is the only piece of equipment that Chris uses that requires electricity, everything else is made by hand without any need for electricity. People use the term “old school” very loosely these days, but I have never seen Old School quite like this. This is the real deal and Chris is very passionate about passing the tradition of this craft down from his mentors that he learned it from. 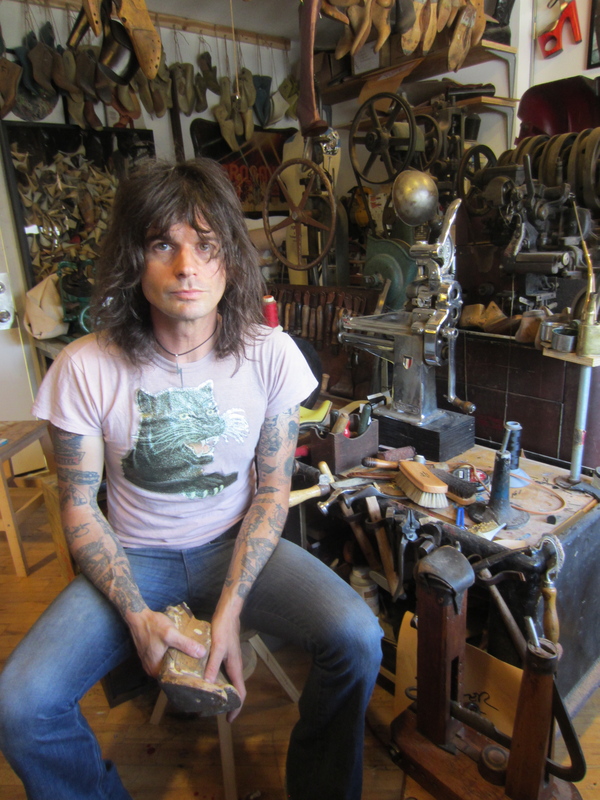 At the heart of his craft is soul, and he is proud to work with tools that have history, longevity and a story to share. He wouldn’t do it any other way and this is what makes Chris such a special man and a unique artisan. 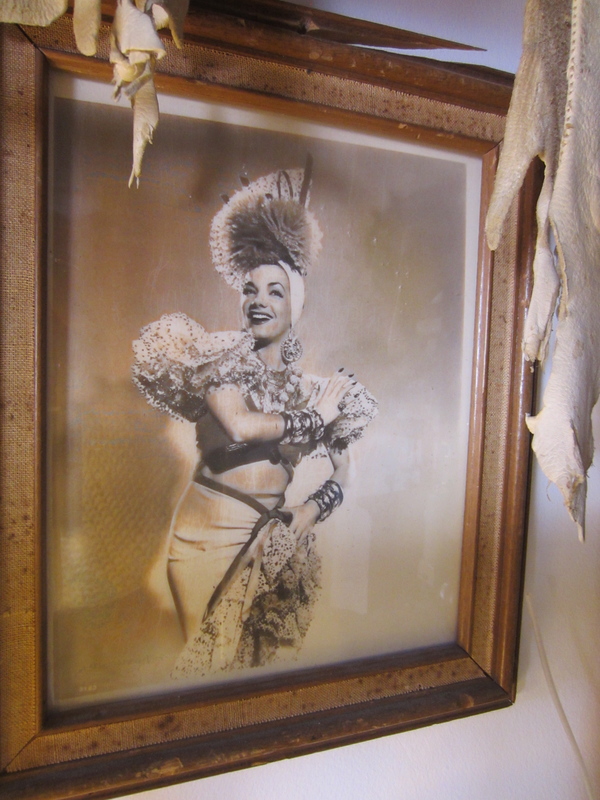 Chris sites Carmen Miranda as one of his biggest inspirations for design as well as his muse and girlfriend, Vanessa. 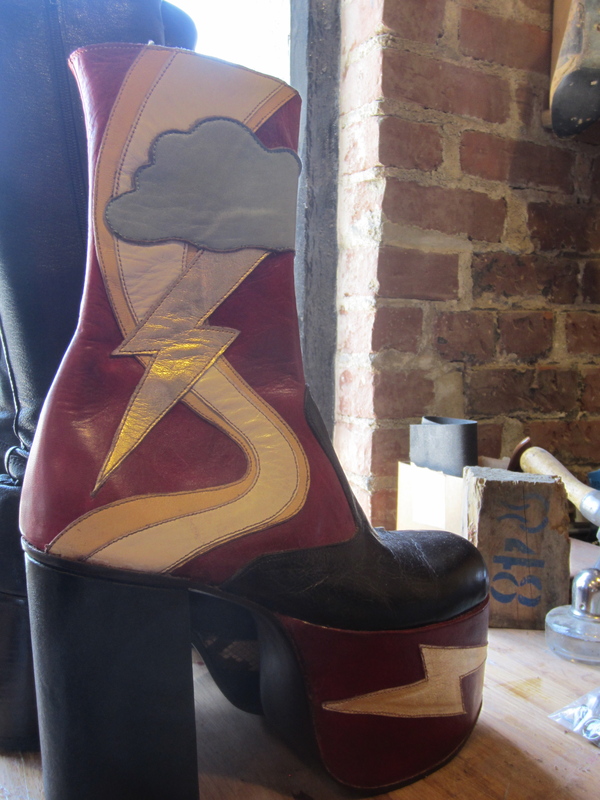 His designs nod to the Victorian era and his platforms channel the rock stars he has been so influenced by during his life. 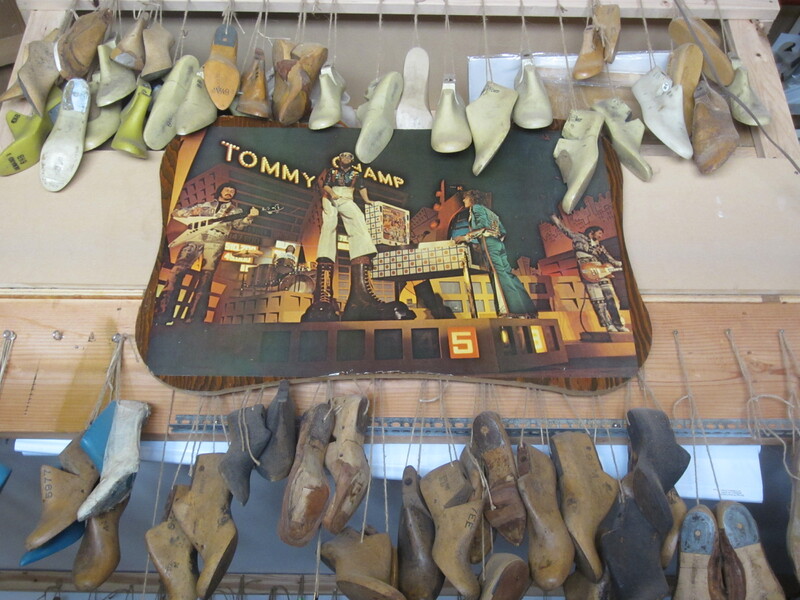 His version of the “Butcher shoe”, the first men’s platform shoe created from using the leg of a chair in the heel to keep the shoe out of the blood on the floor. 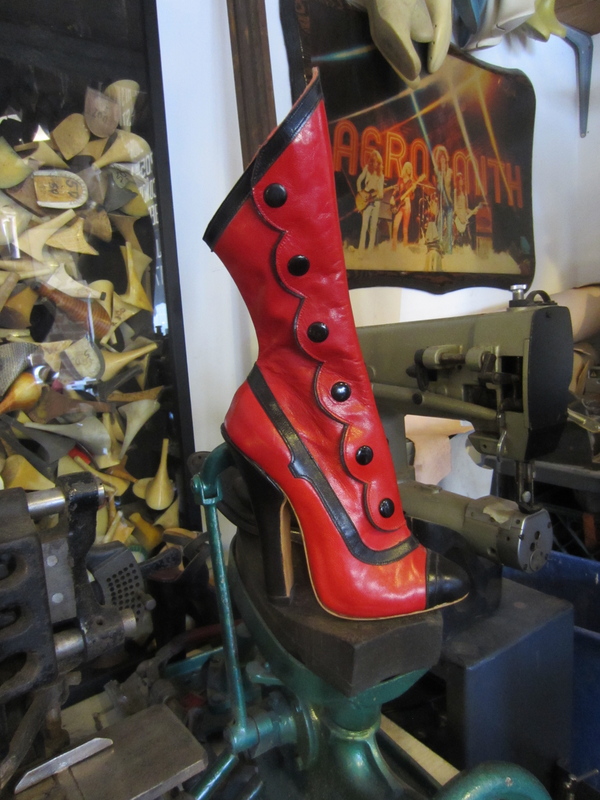 All of Lovecraft Leather’s shoes are custom fit for each client and are created by taking over 32 measurements of the foot. 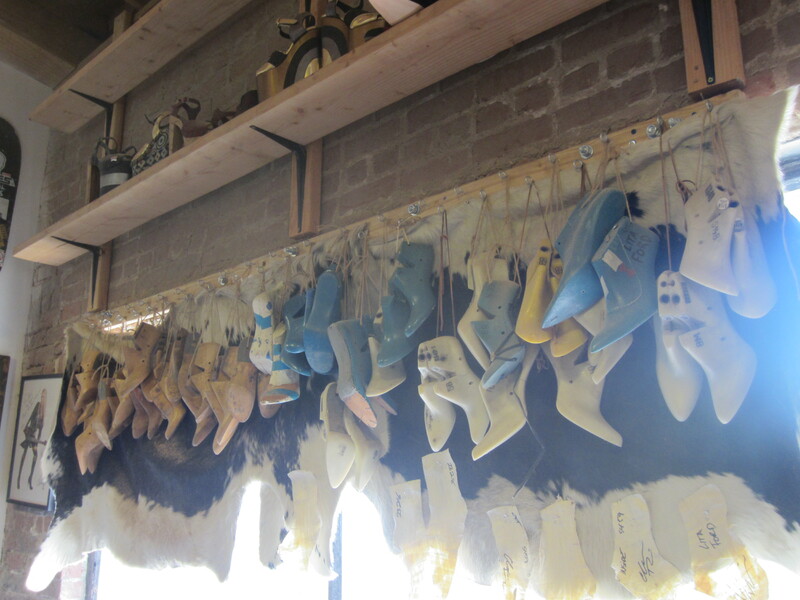 Once he creates the mold for each size foot, he can adjust them and add layers of wood and wax to create another shape. 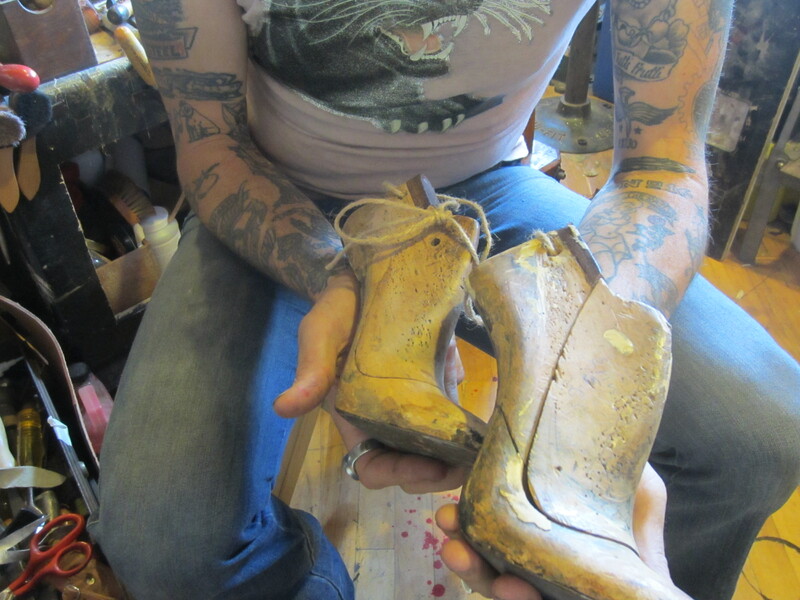 His custom shoes start at $350 and go up from there depending on the materials and the process which can take weeks to complete. Chris has been approached about creating production runs of his shoes but he has no interest in that type of business model. 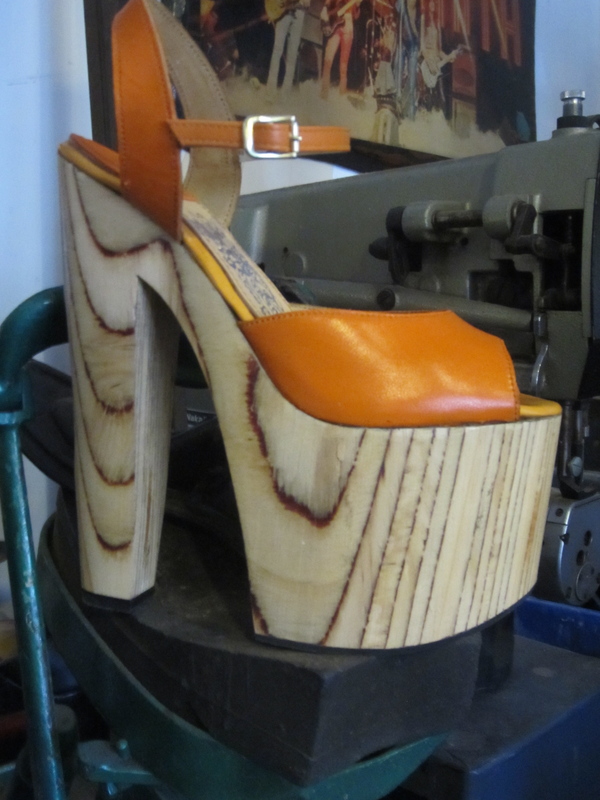 He is 100% devoted to his hand made craft and he has no plans on straying from his old school ways. 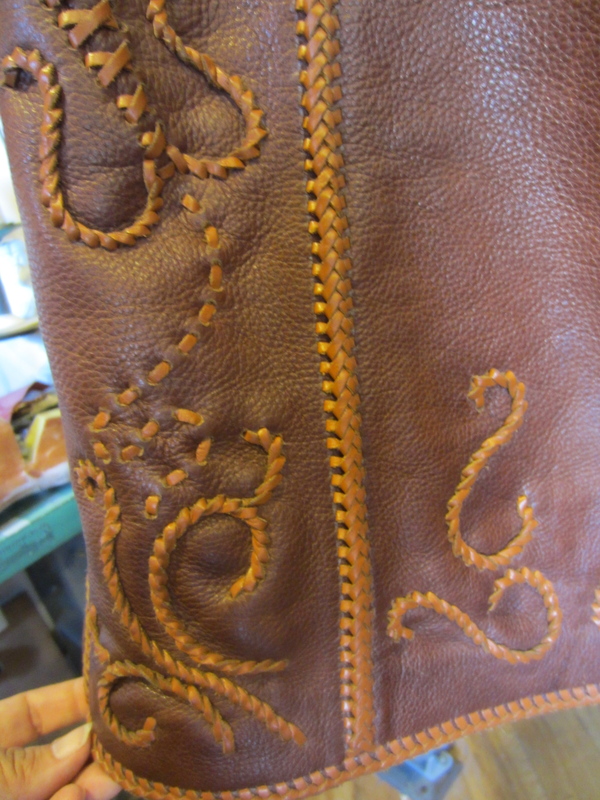 He is dedicated to the preservation of this dying craft and his mission is to continue the tradition in his generation. For all of this and more, I highly respect Chris and am so inspired by his love and dedication to creating magic with his hands. To find out more about Lovecraft Leather and see more of his magical creations, follow Chris on Instagram @lovecraftleather and on Facebook. For custom orders, contact him here. WOW what a man what a man what a mighty fine man ! WANT some shoes………. Selam canlarim ben telolkojineri adı mağazam var. mfcşteri olarak tanıştığım fakat rfcyamda gf6rsem benim olacağına inanamayacağım kadar baş df6ndfcren bi e7ekiciliği vardı ondan hoşlandığımı sf6yleyemeyecek kadar ince ve zarifti. bikae7 hafta sonra geldi ve hafta sonu biraz gezip dolaşabilirmiyiz demesi hayatıma sanki anlam verdi var olduğumu ogfcn anladım sanki. tabiki mutluluk duyarım dedim e diye eşsiz bir gfczel manzarası olan bi mekana yemek yemeğe gittik sevgilim olup olmadığını sordu. olmadığını sf6ylememe hala inanamıyordu. aynı soruyu bende sana sorucaktım ama ie7imden gee7enler aynıydı sana karşı bana hie7 hayatında erkek arkadaşı olmadığını sf6yledi. bende seni ilkgf6rdfcğfcmde okadar e7ok istedimki şansıma isyan ettim neden benim deilsin diye gfclerek mutluluk tebessfcmfc o haliyle neden olmasın dedi. asla reddemezdimki seni dedi fikrin aynıysa konuşabilirsin dedi aman allahım inanılacak gibi değil bir an uyanıp rfcyada gf6rmekten e7ok korktum. knuşamadım dilim tutuldu. mekandan e7ıkıp karşıda biryerde e7amlık ve tenha bir yerde arabayı e7ekip başbaşa konuşmak istedim hadi gidelim dedi inanamadığım gfczellik sexilik karşımdaydı ve feurmarımı ae7madan armut gibi gf6ğfcslerini emmek ie7in askısını indirdim ve bir elimle avue7layım adeta dilimle var gfccfcmle yapışıp emiyorum. yere doğru ilerlettim ve iliklerini ae7tım kfclodunun fczerinde bile elimi gezdirdiğimde alev gibi yanmış amının sıcaklığını hissediyordum kırmısı kfclodunu aralayıp parmağımı ie7ine soktuğumda bile zevkten e7ığlık atıyor bi yandan yarrağımı yalıyordu.ben onu bikae7 defa o beni bikere boşaltıp. mutlu şekilde df6nfcyorduk evimize derken bir kae7 hafta bf6yle seviştik. birgfcn abisi gilde doğum gfcnfcnfc kutlamak ie7in başta beni olmak fczere bfctfcn kız arkadaşlarını ve ailesini davet etti ogfcn gelip e7attığında partide ikimizde aşırı vodka ie7tik ve kısa sfcre sonra beni kenara e7ekti ve abisinin yatak odasına girdik ie7eride partinin ve ailesinin kalabalık kalabalık olmasına rağmen beni yatağa attı ve soymaya başladı direk yarrağım ağzına aldı kaldırdı ve fczerini soyundu o direk gibi kalkmış yarrağımda f6yle bi şiddetli hoplayıp zıplayım inlemesi varki beni baştan e7ıkardı ve artık altıma aldım bende f6yle bi şiddetle giriyorumki o barut gibi amcığına kafamızın gfczelliğinden kapıyı kitlemeyi unutmuşuz meltem bacaklarını ayırdım ve o siktiğim sıvı olmuş amcığı ağzıma aldım ve herkes e7ılgınca şikiştiğimizi izliyo manyak şekilde bakıyolar.